Today, I am sharing with you a nutrient dense, delicious and filling breakfast. 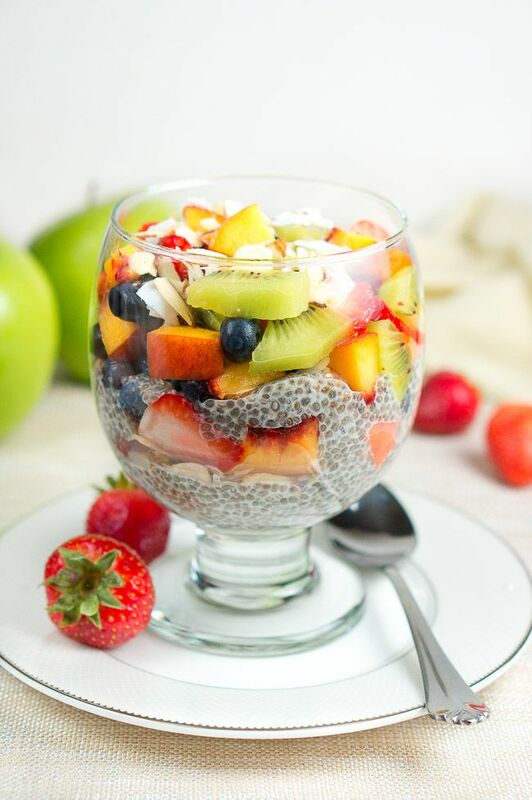 This breakfast fruit chia pudding parfait is SO delicious, fruity and comes together pretty quickly. You can also prepare it the night before and store it in the fridge until the morning. Hope you enjoy it as well! It’s finally Friday! Another week is almost over and the weekend is just around the corner! Do you have any plans for this weekend? The weather here has been very pleasant, low humidity and it’s only in the 80s. I am looking forward to spending the weekend at home and going out on a date with my husband. In a small bowl, combine the almond milk with chia seeds and maple syrup and allow it to sit for about 30 minutes, so it can thicken. Be sure to stir it every 10 minutes or so. To assemble: Add a couple of spoonfuls of chia pudding in a small glass or glass jar. Add one-third of the sliced almonds after the pudding. Spoon some fruits on top. Repeat and add another couple spoonfuls of chia pudding, followed by another one-third of sliced almonds and more fruits. Repeat a final time until the glass/jar has been filled. 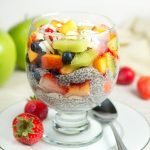 Fruit Chia Pudding Parfait - Quick, healthy, and perfect to whip up for dessert or for breakfast! 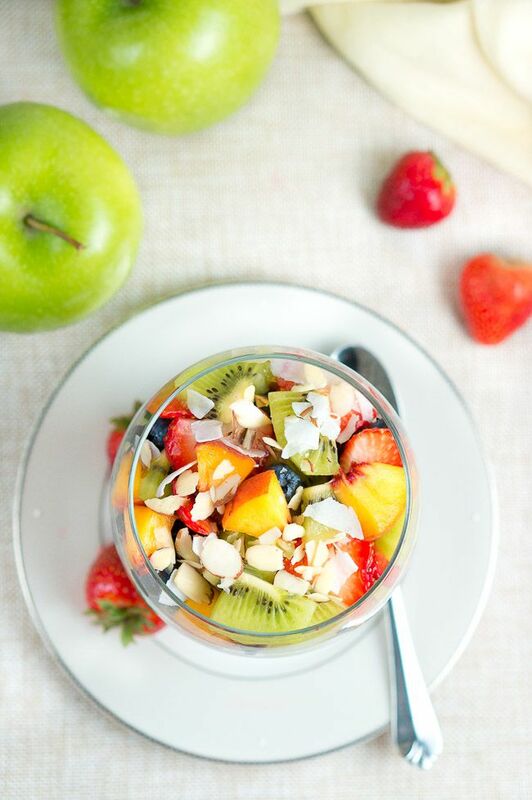 what great way to use up any extra fruit you may have lying around, and still enjoy a healthy shack or breakfast! I have mad something similar and put them in mason jars so i can bring them to work with me for breakfast! I love yours and your pictures are beautiful! This is an excellent idea to use up fruits!!! I have been wanting to try out something with chia seeds .. So I have a recipe now..
Wow This looks so colourful and healthy.. These look amazing and healthy and gorgeous at the same time! 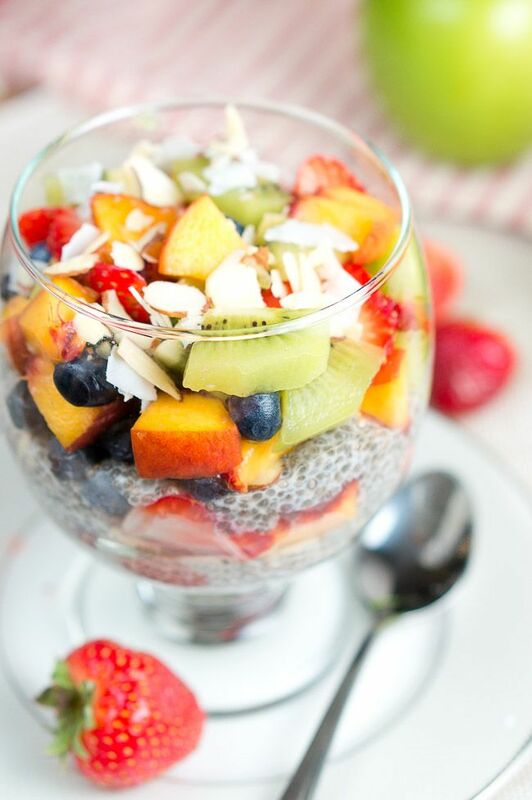 I love adding chia to fruit! They looks so tempting and delicious !! This looks so delicious, I could eat it for breakfast everyday! love your blog. I try to cook healthy too and put the recipes on my blog. I haven’t made chia pudding in a while, but will definitely try this one! It looks gorgeous! Love all the fresh fruit in there. Pinning of course! I’m always looking for healthy dessert recipes and this looks delicious! It’s so hot in Boston right now; I could use a healthy, refreshing snack like this today! Looks so delicious and your photos are stunning! Thanks for sharing! I have yet to try chia pudding, this looks great and really refreshing!